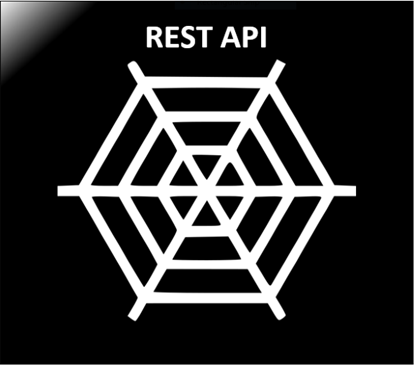 The “hIOmon REST API” software package provides a “Representational State Transfer (REST) Application Programming Interface (API)” with a web service component. It can retrieve information about the hIOmon software (e.g., the current hIOmon Manager status, the status of the active hIOmon ETW I/O Monitor, and usage information for both the hIOmon Manager and hIOmon ETW I/O Monitor). It can also to be used to perform limited control over the operation of the hIOmon I/O operation monitoring software. In addition, it can retrieve a robust set of I/O operation performance metrics that have been collected and automatically-summarized by the hIOmon ETW I/O Monitor software. These metrics include those displayed by the hIOmon Disk I/O Ranger Display. The hIOmon REST API software components can be used together with either the hIOmon "Workload I/O Profiler (WIOP)" or the hIOmon "Workload I/O Profiler for Files (WIOPF)" software packages. • The hIOmon REST API Web Service, which runs as a Windows service. This service obtains the requested hIOmon information and automatically-summarized I/O operation performance metrics from the associated hIOmon Manager, which is active upon the same computer upon which the hIOmon REST API Web Service is installed. • The hIOmon REST API interface enables the retrieval of the unique hIOmon “Performance Threshold Range Metrics” and the hIOmon “Data Transfer Size (DTS) Metrics”, which have been collected and automatically-summarized by hIOmon upon an individual device, file, and/or process basis. Moreover, the retrieval can be based upon a user-specified sorted order with over 70 different sort order options available. • Supports the hIOmon Disk I/O Ranger Display (Workstation/Server versions only), which displays the hIOmon “Performance Threshold Range and DTS Metrics” within a user-configurable “Bar Chart” format as well as a graphical format. Both real-time and historical summary I/O operation performance metrics (i.e., from hIOmon Manager Export Files) can be retrieved and displayed by the hIOmon Disk I/O Ranger Display. The hIOmon REST API web service supports the hIOmon Disk I/O Ranger Display application, which runs as a Microsoft Windows HTML Application (HTA) and is included within the hIOmon WIOP and hIOmon WIOPF software packages. It also supports the “On-The-Web (OTW)” version of the hIOmon Disk I/O Ranger Display that is included within the hIOmon REST API software package. The OTW version is “online/Internet based”; it effectively enables you to connect to the hIOmon REST API web service in a secure fashion and use the hIOmon Disk I/O Ranger Display software within a supported Web Browser. • Incorporates support for Swagger and the Swagger UI (SwashBuckle User Interface). Swagger can generate a “swagger.json” file that provides machine and human readable documentation for the hIOmon REST API. In addition, the included SwashBuckle UI provides an interactive GUI for describing and executing the hIOmon REST API. The hIOmon REST API software package is easy and quick to install. It installs within minutes using the standard Windows Installer. Moreover, no application, operating system, file, file system, or device changes are required. NOTE: The hIOmon REST API software packages, which are made available by electronic download only, are offered as a service upon a 30-day subscription fee usage basis at the prices shown. The subscription period starts upon the date when the hIOmon REST API software package is installed, which must be within the month of purchase. Extended-use licenses for additional days can also be purchased separately. hIOmon REST API version for 64-bit operating systems only. Please note that the price shown below is the service subscription-fee for the initial 30-day usage. The subscription period starts upon the date that the hIOmon REST API software was installed.